EAST FOREST LIVE MUSIC "AUDIO WOMB"
JOIN US FOR ONE OF OUR MANY MICRO CEREMONIES OR SIMPLY COME CHILL OUT TO THE LIVE SONIC SOUNDSCAPES OF EAST FOREST WITH RICH IMMERSIVE VISUALS. REVIVE, REJUVENATE, RECONNECT. 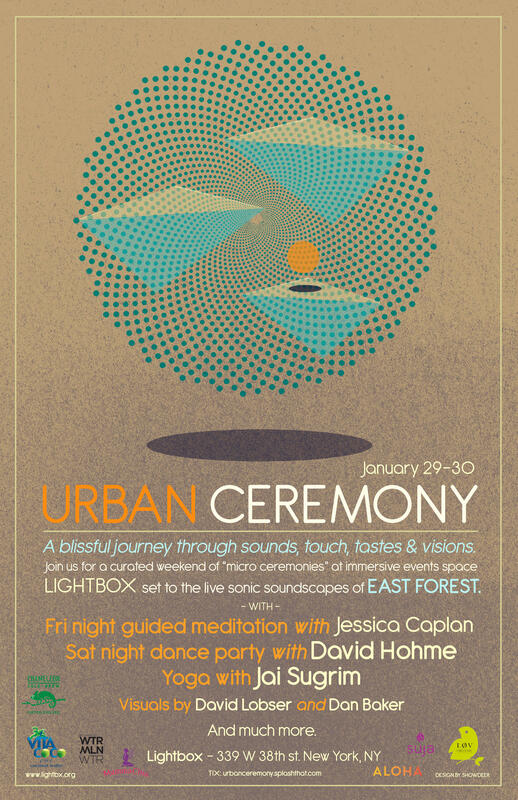 SET IN THE IMMERSIVE 360 PROJECTION EVENT SPACE, LIGHTBOX IN MIDTOWN MANHATTAN, EAST FOREST IS GATHERING A GROUP OF COLLABORATORS TO CREATE A WEEKEND SERIES OF MICRO CEREMONIES EACH HELD IN AN SACRED URBAN CONTAINER WITH LIVE EAST FOREST MUSIC AND WRAP AROUND INTERACTIVE PROJECTED VISUALS. Ligthbox is Manhattan’s premier interactive digital arts space supporting innovation in multimedia experience. We also offer turn-key service for unforgettable private, corporate, and branded events. Lightbox’s flexible industrial space features floor-to-ceiling fully programmable walls, a state of the art sound system, two bars and a mezzanine lounge over nearly 3,000 sq feet of industrial style. Our technical and event strategy team can tailor content and visuals as well as social media activations to match your message, style and mood. Experience the next generation of art and technology at Lightbox, a space with endless possibilities.